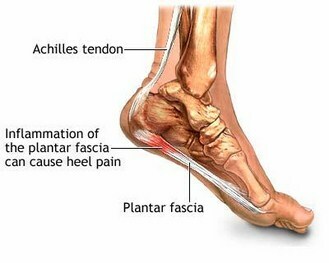 Plantar Fasciitis: Heel Pain Makes it Hard to Walk. As a sports chiropractor, I see a number of foot problems regularly in my West Hollywood/Beverly Hills office, from arch pain to heel pain to corns and bunions—I see it all. In a predominantly walking culture—and I know it’s hard to think of Los Angeles as that, but we walk the Grove, hike Runyon Canyon, shop Hollywood and Highland, and so forth—when the feet hurt, it can seriously hamper one’s lifestyle. One of the more common foot issues I address in my practice isplantar fasciitis—a painful inflammation of the foot, most often felt at the underside of the heel. The plantar fascia is a thick connective tissue that supports the arch of the foot. It attaches to the calcaneus bone, or heel, and acts as a sort of spring during the gait cycle as we walk. In young people, the plantar fascia has some attachments to the Achilles tendon, but as people age, this attachment diminishes and the two become separate and distinct structures. However, don’t let that fool you—the plantar fascia and the Achilles tendon are intimately tied together. So how do you know if you have plantar fasciitis? Your feet probably hurt, big time. Plantar fasciitis is an inflammation, so it will cause sharp, burning pain at the bottom of the feet. It’s pretty unmistakable. It will hurt to walk or stand for very long also. I have one patient that stands on her feet all day at work, and by the end of the day, she’s ready to collapse, the pain is so intense. Another common symptom is that you probably have an intense foot pain first thing in the morning when you get out of bed. Stepping down on the floor after a full night’s sleep is likely to be excruciating. If you have that kind of foot pain in the morning, then guess what? You’ve got plantar fasciitis. Why does this happen? 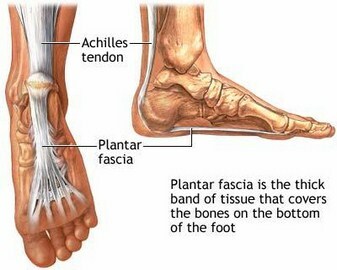 The plantar fascia actually shortens and tightens over night while sedentary. Plantar Fasciitis is neither easy to treat nor is it always quickly resolvable, but if approached diligently, it can heal completely and within a reasonable time. The first thing we do in my West Hollywood/Beverly Hills Sports Chiropractic office is to break up any adhesions that have built up in the fascia. We do this with a manual therapy, a myofascial releasetechnique—it’s very effective. We then ice up the foot, fifteen minutes to break the inflammation. We work the calves and Achilles tendon manually as well, to break up any adhesions and tightness there. And then we show the patient home care. The first thing a person with plantar fasciitis must do on their own is to continue to stretch the contracted plantar fascia. There are two ways to do this: the first is by rolling the foot on a tennis ball; the second is by using an icy cold coke can so that you can get the benefits of the stretch and cryotherapy at the same time. Icing with an ice bag is also useful. Chiropractic adjustments of the pelvis, low back, sacrum and ankles will likely be necessary to make sure the joints are moving properly. The next thing that must be done is regular stretching of the calf muscles. Remember that I said that the plantar fascia and the Achilles tendon are intimately tied together. What this means is that, although they become distinct structures in adulthood, when the Achilles tendon (tendon of the calf muscles) is tight, it yanks on the plantar fascia causing inflammation and ultimately, adhesions. Stretching the calf muscles is both the treatment and the prevention. There is a special way to stretch the calves for maximum benefit, but for that you will need to contact a sports chiropractor to learn the proper way to do the stretches. If you reside in Los Angeles, West Hollywood or Beverly Hills, then you can contact my office and we will be happy to discuss how to make your plantar fascial problem go away for good. There are a number of things one can do to prevent planter fasciitis. Some lifestyle changes might be needed for long-term prevention. Losing weight is one since carrying excess weight is hard on the plantar fascia. The connective tissue, although strong, will collapse at a certain load. Plantar fasciitis is not uncommon in the obese. It’s an unfortunate situation as it can seriously hamper an exercise routine, leading to a vicious cycle of weight gain and foot pain. Having the proper shoes is also crucial. For instance, plantar fasciitis is known as “flip-flop disease” among podiatrists, simply because people who suffer from the condition have a high propensity toward wearing sandals. Shoes should be closed backed and not high heels—especially not when symptoms are present. Does it mean the sufferer of plantar fasciitis can’t ever wear flip flops or heels? No, but wearing that footwear should be minimized. The best preventative measure one can take, though, is to get fit for custom-made orthotics. 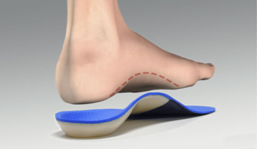 Orthotics will provide support for the arch, a cushion for the heel and prevent over pronation, which is a gait abnormality that predisposes one to developing plantar fasciitis in the first place. Custom-made orthotics can not only do wonders to help relieve the pain associated with this foot disorder, but as an overall preventative, it can’t be beat. 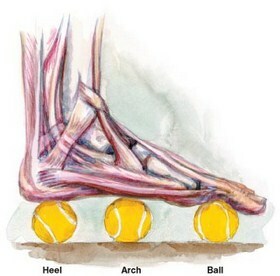 Another way orthotics can help is by preventing the wearer from walking on the balls of his or her feet. Although the pain of plantar fasciitis is usually felt in the heels, it’s of mega-importance to continue walking on them, as walking on the front of the foot, or the ball of the foot (which many people do to minimize the pain) can actually make the problem worse. If you are having sharp, stabbing or burning foot pain in the heel or soles of the feet, then you need to get checked by a chiropractor right away. Plantar fasciitis can stick around for a long time—as long as one year—if left unattended. A sports chiropractor will be able to asses your problem, treat it on the spot, and provide you with the proper preventative measures that should keep you on your feet—pain free—for a long time.